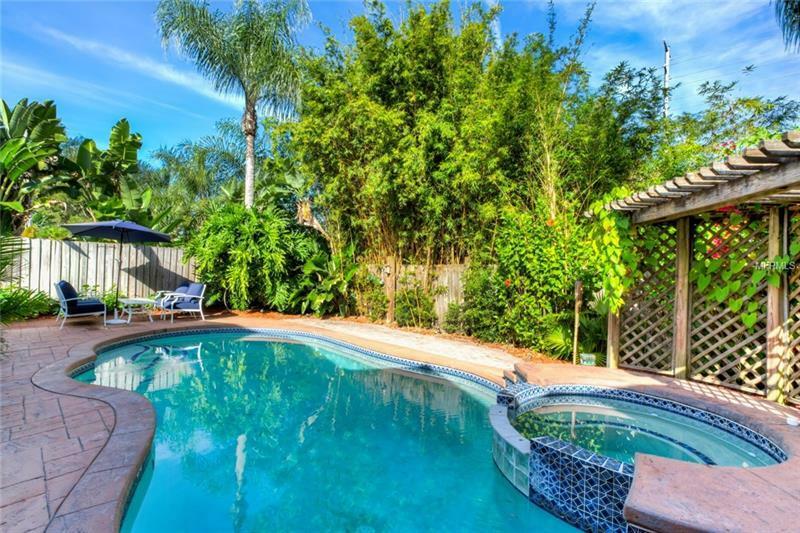 Sellers Motivated on htis pool home nestled on the tree lined streets of Lake Conway area minutes from downtown Orlando Orlando Airport and ALL major highways. This 3/2 chic open floor plan is sure to please with vaulted volume ceilings & laminate and tile flooring throughout. (no carpet) Enjoy the open feel as soon as you enter with views of the pool and lush backyard and private landscaping. Nice split bedroom plan with master suit being over sized with a connecting master bathroom with double sink vanity and large walk in closet. Family room and dining room are spacious with built in wall unit and leads out to a grand Florida room. This versatile room could be used as a game room or family room and offers beautiful Mexican Saltillo tile and abundant windows with panoramic views of the tropical paradise that awaits you out back. Fenced and landscaped backyard for complete privacy while you're entertaining or using the pool and heated spa. There is even a side porch perfect for outdoor grilling. Sprinkler system and NEW SOD being installed soon. Survey available. A MUST SEE!! Seller will transfer existing home warranty to new buyers. $2000 Lowes Gift Card towards new appliances.